Having several domestic stock mutual funds in your investment account may be the right choice for portfolio diversification. Depending on your risk tolerance and market volatility, you should invest about 20% - 50% of your total asset portfolio in these domestic stock funds especially large cap domestic stock funds. One of this best domestic fund is listed below. For more top rated fund review, please check MEPB Financial. 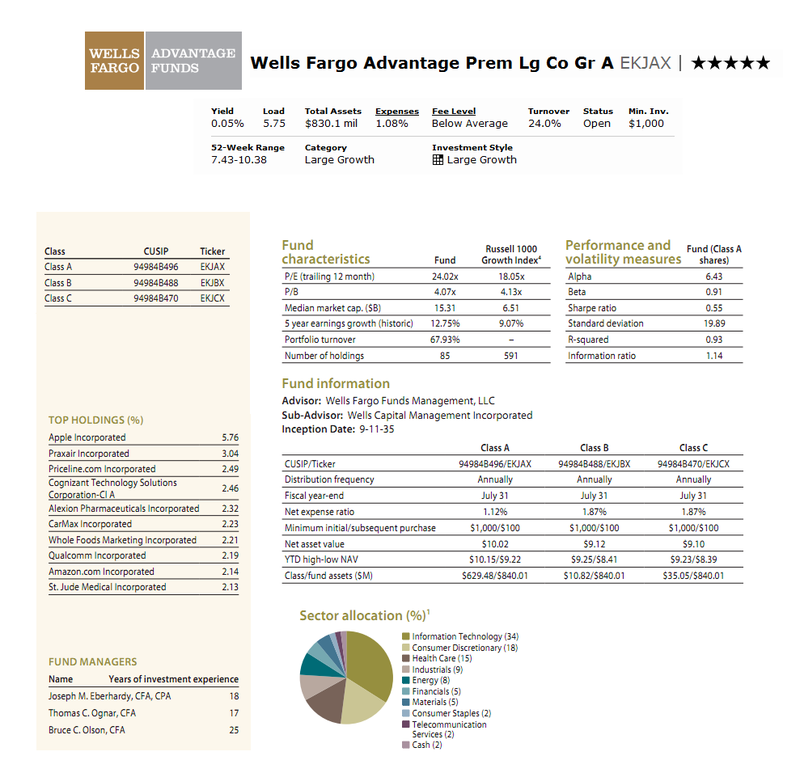 The Wells Fargo Advantage Premier Large Company Growth fund’s objective is to provide long-term capital growth. 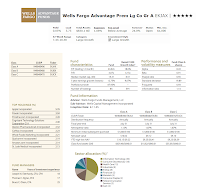 This Wells Fargo Advantage fund invests >80% of net assets in equity securities of large-capitalization companies and <20% of the total assets in equity securities of foreign issuers, including ADRs. It invests principally in equity securities of large-capitalization companies similar to companies in Russell 1000 Index. This Large Growth Domestic Stock fund may use futures, options or swap agreements, derivatives, to manage risk or to enhance return. Details of the fund review is below. Aziz Hamzaogullari has been the fund’s manager of this Wells Fargo Advantage fund since June 2006. This top rated Wells Fargo fund was introduced to public on January 1998. This EKJAX fund has an expense ratio of 1.08% per year. This expense fee is comparable to the average in the Large Growth category (1.31%). The total net asset of this fund is $830.12 million. It does have a little yield of 0.05%. This fund does charge 5.75% front-end sales load fee. But there is no management fee. This fund has a 3-year beta risk of 0.91. The benchmark of this fund is Russell 1000 Growth Index. This large growth stock fund is rated with 5-stars rating by Morningstar as it has recorded 8 years of positive return since its inception 12 years ago. The best 1-year total return was accomplished in 2009 with 39.61% and the worst was occurred in 2008 with -28.70%. This fund currently has 6.81% YTD return and 9.08% 5-year average return. The other classes of this fund are Class B (Ticker: EKJBX) and Class C (EKJCX). The class B share is currently closed to all purchases. Class B and Class C have 1.87% expense ratio. To start investing in this WFA fund or buy this mutual fund online, investor will need $1,000 minimum balance for brokerage account or $250 for IRA account. This fund requires $100 for the minimum subsequent investment. This best rated domestic stock fund can be bought from 92 brokerages, such as JP Morgan, TD Ameritrade Inc, Vanguard, Merrill Lynch, Edward Jones, E Trade Financial, Morgan Stanley Advisors, Firstrade, Schwab, Royal Alliance, etc. The top 10 holdings of this EKJAX fund are Apple Incorporated (5.76%), Praxair Incorporated (3.04%), Priceline.com Incorporated (2.49%), Cognizant Technology Solutions Corporation – Class A (2.46%), Alexion Pharmaceuticals Incorporated (2.32%), CarMax Incorporated (2.23%), Whole Foods Marketing Incorporated (2.21%), Qualcomm Incorporated (2.19%), Amazon.com Incorporated (2.14%) and St. Jude Medical Incorporated (2.13%). The top 5 sectors of this fund as of June 2011 are Information Technology (34.0%), Consumer Discretionary (18.0%) and Healthcare (15.0%). According to the fund’s prospectus, the fund investment risks are: Counter-party risk, Derivatives risk, foreign investment risk, Growth style investment risk, Issuer risk, large cap company securities risk, Leverage risk, Management risk, Market risk, Regulatory risk, etc. Details can be found in the fund’s website.